Electronics Costs > How Much Does iPhone Broken Screen Repair Cost? How Much Does iPhone Broken Screen Repair Cost? Unfortunately, one of the most common problems with the iPhone is when the screen breaks. When the glass breaks, it usually won’t shatter completely, but rather, it receives a spider web type crack, similar to the picture below. While the phone will still work most of time, many users opt to repair it for cosmetic reasons. How much does it cost to repair a broken iPhone screen? Depending on the type of iPhone you have and the repair service you use, the costs to repair an iPhone broken screen can vary anywhere from as little as $29 if you had AppleCare+ to as much as $250 if you were to use a third party service. This is the price for the screen repair alone. If you were to use Apple, they charge $129 for every iPhone, except for the iPhone 6s Plus and iPhone 7 Plus, which will cost $149. If you had AppleCare, it would be a flat rate of $29. You don’t have to go to Apple to have your screen replaced, but if you were to, you have to keep in mind you will be voiding your warranty for doing so. 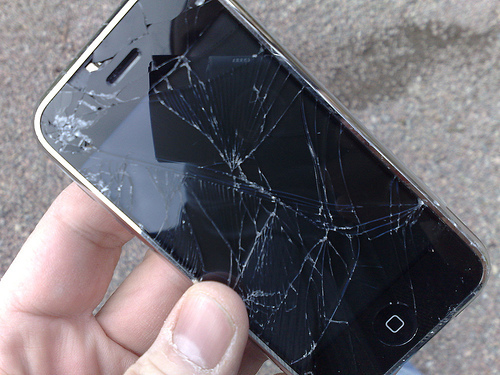 iCracked, a startup that comes to you to fix your cracked iPhone screen, will charge about $100 to fix any iPhone screen. CNet contacted a few stores in the Los Angeles area and had found most were charging anywhere from $100 to $250 to fix a broken iPhone 6S screen. The Washington Post says the costs to replace a shattered screen at an independent shop will about $100 to $150, while ordering a DIY kit can cost $40 to $100. If shipping it to Apple, for example, a small shipping fee will apply, but this can be waived if you were to bring your phone into a local Apple Store. This is usually less than $10. Outside of the screen, the phone may need other parts replaced, especially if the phone doesn’t turn on. Again, depending on your phone’s make and model, common repairs can range anywhere from $199 to more than $400. Always check your warranty first before you use any professional service. If you’re unsure, visit this website to see what’s covered right now. There are three outcomes: it will either be out of warranty, within the one-year manufacturer’s warranty or covered by AppleCare+ if you signed up for it. Even if you had a warranty, it doesn’t mean it will be covered 100 percent. Depending on the scenario, it will either be denied because of accidental damage or a deductible may apply. Solution Owl highly recommends taking it to Apple for two reasons: first, Apple will actually give you a 90-day warranty on the device. Secondly, the costs, when compared to other third party services, is actually quite reasonable. If you were to use an option outside of Apple, the company will void your warranty and will not provide any additional repairs. Take a look at what a reconditioned/used phone would cost on eBay or even at a local cell phone store. If the costs of a used or even a new one that isn’t much more, then you may want to consider purchasing a new phone. If going this route, sell your old phone online and be sure to disclose its condition, and with this money, you can put it toward a new phone. As long as your phone works, you can always live with it, especially if you’re short on cash. Remember, this is just a cosmetic condition that has no effect on your phone. To play it safe to protect your fingers while swiping, you may want to consider a thick glass screen protector for about $10 to $20. In most cases, and as mentioned, going to Apple is going to be your cheapest and best route now; however, the only small benefit you may see if you were to go to a third party would be the speed of the process. Most of the time, you can receive your phone in as little as an hour. Don’t be fooled by the $15 to $35 replacement kits as they don’t live up to the expectations. If you don’t believe us, take a look at the Amazon reviews. Replacing the glass on an iPhone, especially the newer models are much harder and could cause even more damage if done wrong.